If you have Blacklisted a domain or single address but still receive mails from someone at that domain, I have two possible solutions for you. The spammers now know they are getting through your anti-spam protection, so email the user more than ever. The user now asks IT to block the spammer. IT blocks the spammer’s email address. IT blocks the spammer’s whole domain. When the user replies to the spammer (Step 2), Mail Marshal adds the spammers address to its Auto-Harvested Whitelist. Even when IT adds the email address to the Blacklist, the whitelist takes precedence. To resolve, simply delete the entry from the Auto-Harvested Whitelist. If the Spamee has never responded to the Spammer (ie, start at Step 4 in above example), then they could be using an email marketing company to send their spam out for them, in which case the Email address might be different to the address/domain that you have blacklisted. 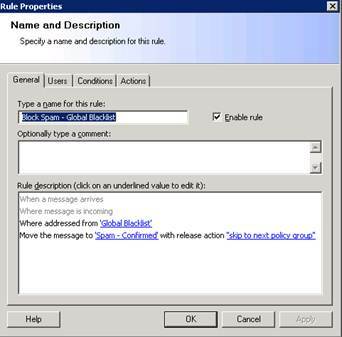 By default MailMarshal has a Connection Rule to check against the Global Blacklist to block mails coming into the organization. The only problem with that is a Connection Rule can only see the address, so in the case of our example the mail will still get through. To deal with this you will need to create a new Standard Rule to be able to check the originator address header field (Sender address). This Rule will then catch any mails that make it past the default Connection Rule. Nice post. You pointed on very important facts by this post. This is really very informative and useful information. You can get some more information here email marketing jobs in hyderabad Thanks for sharing this post.